There's a lot of planning that goes into traveling. And people increasingly turn to devices for help. 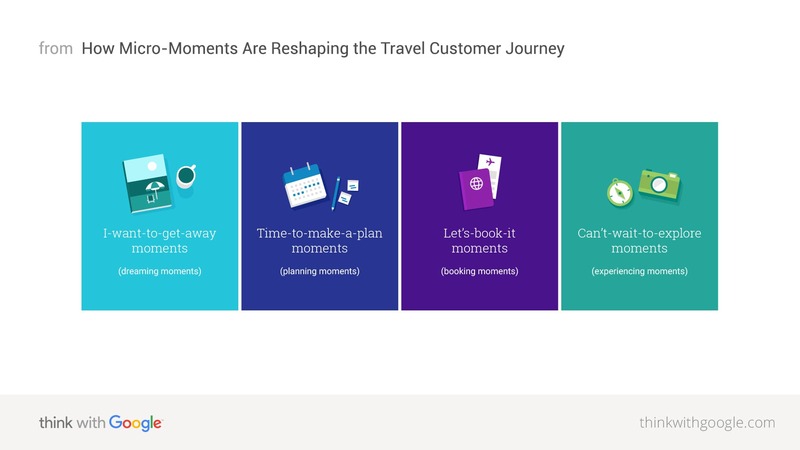 This introduction to a six-part series reveals the consumer trends shaping these travel micro-moments, how they affect the travel customer journey, and why they matter for travel brands. As more research happens in the traveler's customer journey, there are more micro-moments—when people turn to a device with intent to answer an immediate need. In these moments, the stakes are high for travel brands as preferences are shaped and decisions are made. What happens in these micro-moments ultimately affects the travel decision-making process. 40% of U.S. travel site visits come from mobile. Let's break that down: Travelers increasingly turn to mobile in shorter spurts to make informed decisions faster than ever before. For marketers, this phenomenon has huge implications for the entire travel decision journey across devices and channels. Travel micro-moments start when people begin dreaming of a trip, and they continue all the way through the long-awaited trip itself. These moments tend to fall into one of four categories, which map closely to the stages of the travel decision-making process: dreaming, planning, booking, and experiencing. I-want-to-get-away moments: a.k.a. "dreaming moments" that happen when people are exploring destination options and ideas with no firm plans. At this stage, people are looking for inspiration. Time-to-make-a-plan moments: a.k.a. "planning moments" that happen when people have chosen a destination. They're looking for the right dates, the right flight, the right place to stay, and all the things they'll do while they're there. Let's-book-it-moments: a.k.a. "booking moments" that happen when the research is done, and people are ready to book their tickets and reserve their rooms. Can't-wait-to-explore moments: a.k.a. "experiencing moments" that happen when the trip is underway. Travelers are ready to live the trip they've been dreaming about—and share it with others. Seventy-two percent of travelers with smartphones agree that when researching on their smartphones, they look for the most relevant information regardless of the travel company providing the information.5 In other words, they're more loyal to their need than to any particular brand. For travel brands, this means you have to earn (and re-earn) each person's consideration in every micro-moment they experience. How? Be there. You can't win if you're not in the game. Identify the micro-moments for travelers that fit your business, then commit to being there to help when they happen. Be useful. If you want to win the hearts and minds (and business) of travelers, you'll need to do more than just show up. Be relevant to the person's need in that moment. Connect them to the inspiration they're looking for and to the answers they want. To be there and be useful across all travel moments, think about the intersection of these two. Try mapping out the customer's path to purchase. What is the traveler's need that you're solving for, what is their current situation or context, and how can your brand help? Red Roof Inn provides a great example of how to combine intent with context to address a specific need for the stranded traveler. Realizing that flight cancellations leave an average of 90,000 U.S. passengers stranded every day, the Red Roof Inn marketing team developed a way to track flight delays in real time and trigger targeted search ads for their hotels near airports. These ads said, in essence, "Stranded at the airport? Come stay with us!" They committed to those let's-book-it moments and delivered with relevance on people's needs. The result: a remarkable 60% increase in bookings across non-branded search campaigns. The business case for micro-moments thinking is clear. According to recent research that Google commissioned from Forrester Consulting, companies that take steps toward being moments-ready earn a markedly stronger ROI in both mobile and overall marketing investments. The latest consumer trends that define each of these travel micro-moments and how they're affecting travel industry trends. Snapshots of real travelers' research journeys, including the searches, clicks, website visits, and video views on their way to booking. Actionable ideas for travel marketers to be there and to be useful in each type of micro-moment. Examples of travel brands that are already seeing success with micro-moments thinking. Let's get started. Read on for the next article in this series. 1 Google/Phocuswright, leisure traveler study, base: U.S. leisure travelers, n=930, Oct. 2015. 2 Google/Ipsos Connect, travel playbook omnibus, n=1664, among U.S. travelers 18+, Apr. 2016. 3 Google Analytics aggregated data, U.S., Travel vertical, Apr. 2016. 4 Google Analytics aggregated data, U.S., quarter-on-quarter, Travel vertical, Q1 2016. 5 Google/Ipsos Connect, travel playbook omnibus, n=1,063, among U.S. travelers 18+ who use a smartphone and for whom the statement is applicable, Apr. 2016.